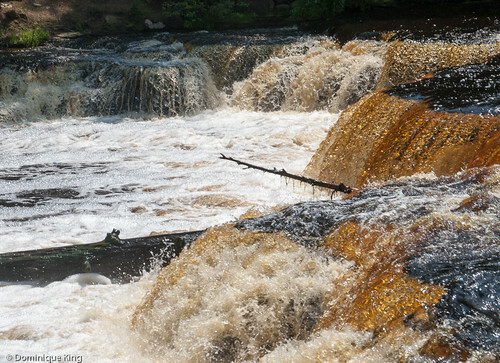 Michigan's Tahquamenon State Park and "The Root Beer Falls"
The amber-colored Upper Tahquamenon Falls in Michigan's Upper Peninsula earned their nickname of "Root Beer Falls" for their resemblance to a cascade of root beer tumbling over a nearly 50-foot drop. 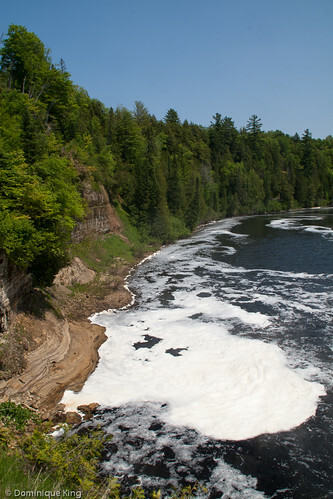 The falls' color comes from tannins leaching into the Tahquamenon River from the cedar, spruce and hemlock swamps along its shores. 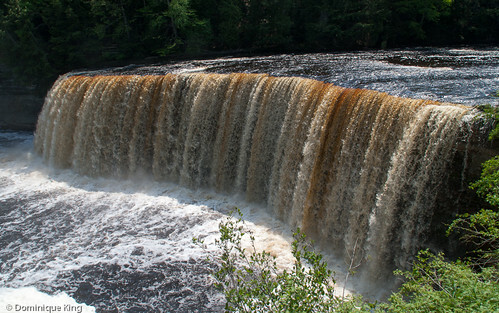 The Upper Falls and the Lower Tahquamenon Falls are the centerpiece of Tahquamenon Falls State Park, which attracts nearly 500,000 visitors each year to its 48,000 acres of wilderness. The park stretches over 13 miles of mostly undeveloped woodland without roads, buildings or power lines. What the park does have is nearly 40 miles of hiking trails, 13 inland lakes, 24 miles of the Tahquamenon River, a portion of the North Country hiking trail and, of course, the Upper and Lower Tahquamenon Falls. The Upper Falls are more than 200 feet across and are especially impressive during the spring when as many as 50,000 gallons of water cascade over the 50-foot precipice each second. 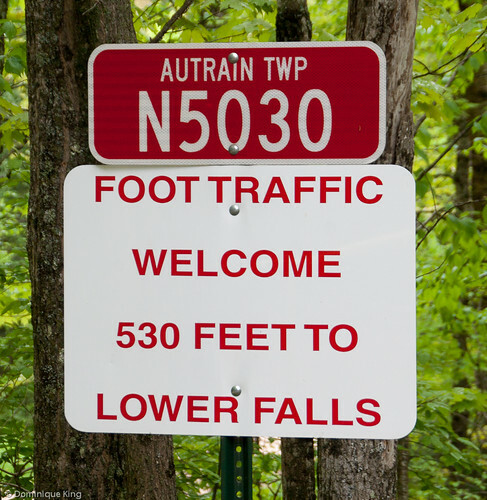 A 0.4-mile paved walkway leading through hardwood forest from a parking lot near the Upper Falls offers easy access to overviews of the Upper Falls. Get a close-up look at the brink of the Upper Falls by taking 94 stops down to the main viewing deck, or you can take 116 steps down into the gorge for a panoramic view. 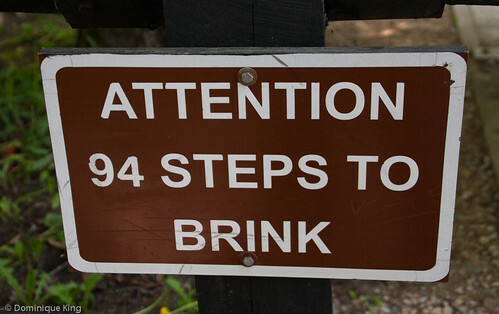 I ventured down (and back up) the 94 steps to shoot a few pictures and a short video clip at the top of the waterfalls. 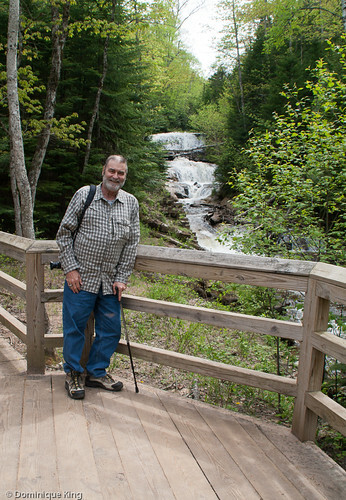 A four-mile hiking trail goes from the Upper Falls to the Lower Tahquamenon Falls. 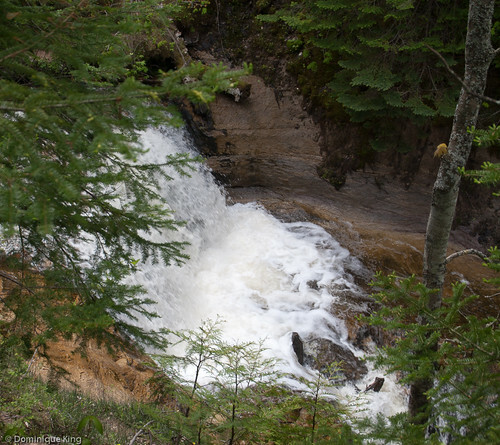 You can also drive the four miles along Highway M-123 to park and take a 1/4-mile boardwalk to the series of falls cascading around an island in the Tahquamenon River. View these waterfalls from the riverbank, rent a boat at the falls for a closer view or walk a little way upstream where many people like to wade in the river. 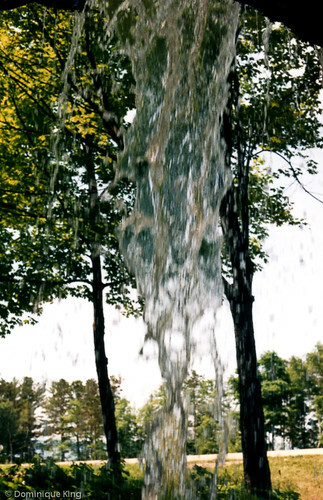 Most park visitors come to see the waterfalls. 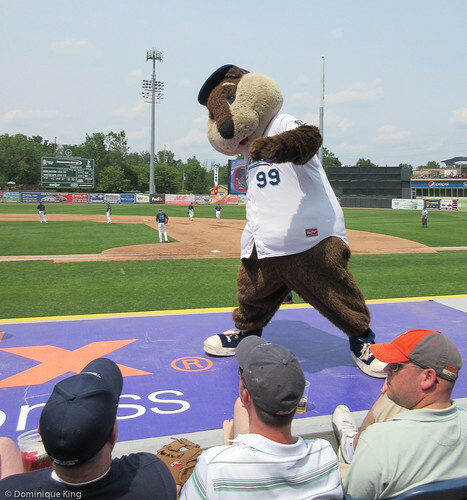 In 2013, total attendance at the park was 483,436 with 369,147 people visiting day-use areas of the park. The park recorded 21,207 booked camp nights at modern and rustic campsites at the park during that year. Other park activities include hiking, picnicking, fishing, photography, kayaking, hunting, fall color tours, snowshoeing, cross-country skiing, snowmobiling and dog sledding. Birders flock here during the fall and spring migrations with over 300 species of birds documented as passing through the park. Sharp-eyed visitors may see animals like moose, bald eagles, coyotes, otters, deer, foxes, porcupines, beavers, minks or black bears at the park. I remember seeing a snapshot of a black bear lounging at a picnic table near the Upper Falls gift shopduring one of our visits to the park about a dozen years ago. A year-round schedule of events includes naturalist-led programs with opportunities to try things like geocaching or archery or to participate in an event called "Owl Puke Investigation" (yup, it looks like the program is pretty much what the title says it is!). Upcoming events through this fall and winter include a 17-mile Wilderness Canoe Race (September 13), a guided hike between the Upper and Lower Falls via the River Trail (September 27) and a Harvest Festival (October 11), as well as guided snowshoe hikes and lantern-lit cross-country skiing (every Saturday in February). A popular stop for many park visitors, especially after scaling the steps to and from the falls, is Camp 33, a restaurant and brew pub near the trail to the Upper Falls. Logging played an important part in the settlement of the area during the late 1800s, and restaurant founders Jack and Mimi Barrett established it to resemble a vintage logging camp. 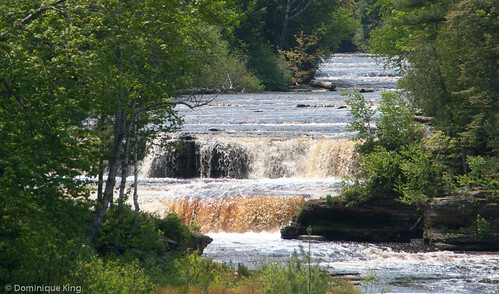 The couple purchased land next to Tahquamenon Falls in the late 1940s when you could only reach the falls by boat. Jack Barrett worked to get an access road to the falls and negotiated with the Michigan Department of Natural Resources to sell the land to Michigan, requiring that the state open it as a state park and retain most of its wilderness character. The state accepted Barrett's terms and paid him $1 for his land, with the exception of a 2-acre plot that Camp 33 now occupies. I'd say that has to be one of the best one-dollar investments ever made by the State of Michigan! 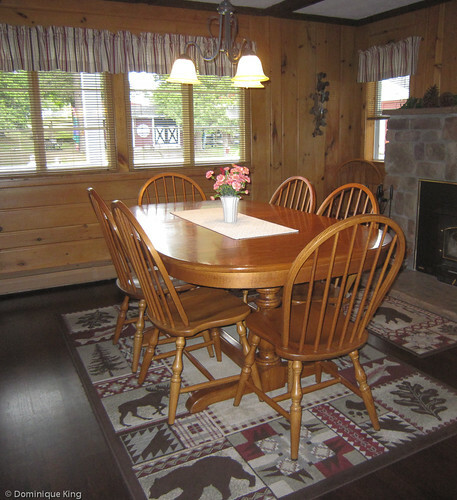 The Barrett family rebuilt Camp 33 in the 1990s, with Jack and Mimi's grandchildren establishing the Tahquamenon Falls Brewery and Restaurant in 1996. The Upper Peninsula is a big place, so it helps to have a good map book and guide to the area. I'd suggest checking out the Michigan Atlas & Gazetteer by the Delorme Mapping Company. Our in-dash GPS is nice, but we still keep one of these books in our car when we're traveling. 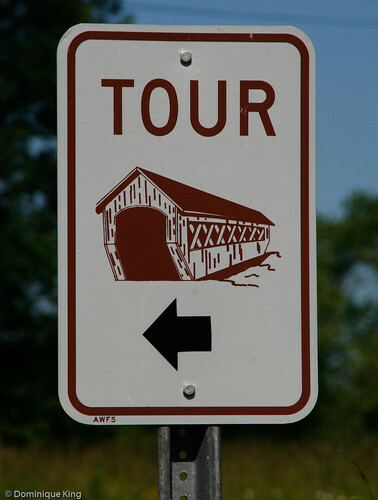 Driving into the Ohio Covered Bridge Scene-I love bridges, and I especially love the sense of romance and nostalgia that vintage covered bridges evoke. I've seen a lot of covered bridges in Ohio, but Aaron shares some images of a couple of covered bridges he found in the north-central part of the state we've yet to see ourselves. Check them out at The Adventures of elATLboy blog. 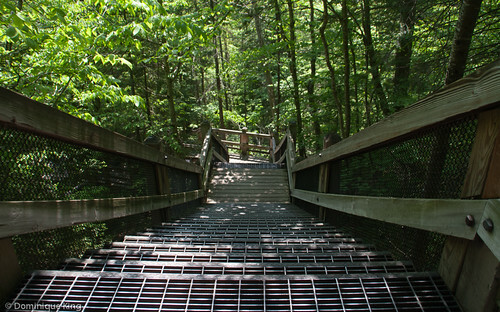 Hike the Pleasant Hill Trail at Ohio's Mohican State Park-Take a walk with Tonya along a trail that starts at a covered bridge in this state park in central Ohio. We've long wanted to visit this park, so I enjoyed seeing these images of the trail at The Traveling Praters blog. Treehouses and Cabins at The Mohicans-How cool would it be to stay in a treehouse cabin? 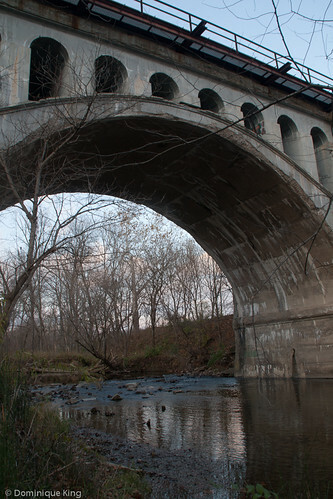 Michael shares his experience doing just that in central Ohio near Mohican State Park. Check it out at the Discover Ohio blog. 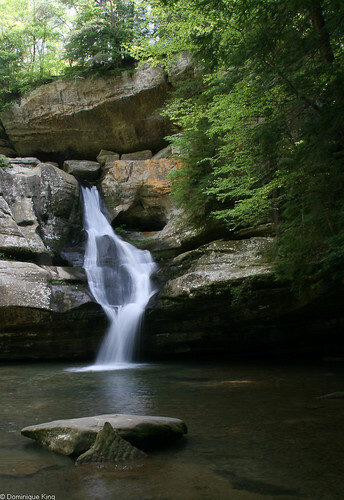 Hocking Hills IQ Quiz: Can You Identify these Landmarks?-Bob put together this nifty photo quiz with 10 images of the beautiful Hocking Hills area in central Ohio. We've visited the waterfalls, caves and trails in the area several times, but there were a good number of places in this post that we haven't been able to visit yet. Check it out at the TrekOhio blog. See Munising Falls-We visited Munising Falls in Michigan's Upper Peninsula last summer, but Amanda's story about visiting the waterfalls makes it clear that visiting during the winter is an entirely different experience! Check out the images of giant column of ice created by the falls at the Things to do in the U.P blog. Four Types of Detroit Tours You'll Want to Experience-Dan from Visit Detroit neatly sums up some of the great variety of tours sure to entice and interest Motor City visitors. 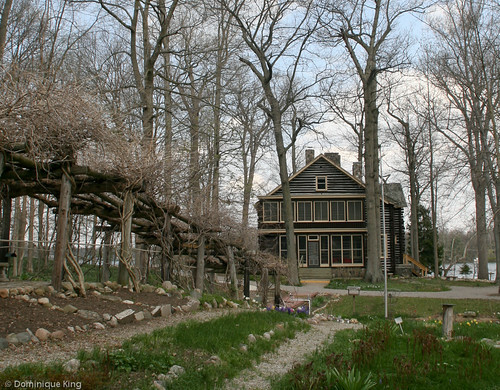 This list includes many places we ourselves visited and loved over the years. Check it out at the Pure Michigan blog. Detroit's Historic Boston Edison Neighborhood-Take a look at one of Detroit's beautiful historic neighborhoods. 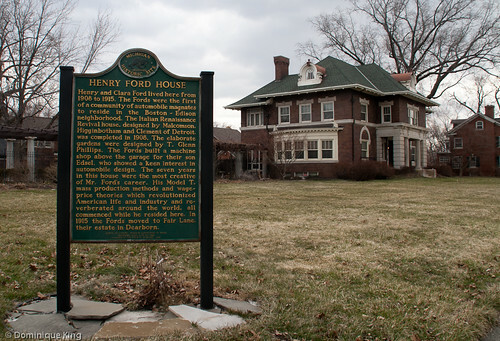 The Boston-Edison neighborhood sits about 5 miles north of downtown Detroit and has some really great early twentieth-century homes. 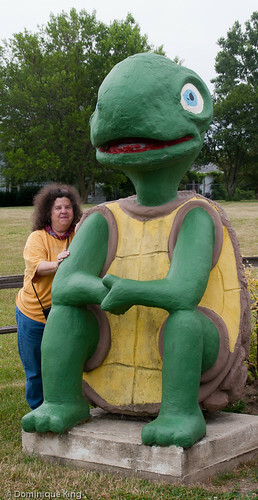 Check out Charlie's story about it at his Bikes, Books & A Little Music blog. 10 Things You Might Not Know About the Cincinnati Music Hall-This beautiful 1878-vintage performance hall in Ohio's Queen City has an interesting and somewhat spooky past. Check out Cassie's rundown on the building and its background at LocalView Cincinnati. Quirky Attraction: St. Paul Indian Mounds-Scott specializes in finding quirky sites on his travels and shares this tale of Indian burial mounds near downtown St. Paul, Minnesota. Check it out at the Quirky Travel Guy blog. Collinsville, IL: Cahokia Mounds State Historic Site-Here's yet another Indian burial mound site in the Midwest. Adam finds this World Heritage Site in southern Illinois near downtown St. Louis, Missouri. Check it out at the Visit Flyover Country blog. Enjoying Conner Prairie's Great Outdoors-We've only visited the Conner Prairie interactive history park once-during a dark and rainy November evening as participants in their acclaimed Follow the North Star Underground Railroad experience. I loved seeing this story about some of Sarah's favorite Conner Prairie sights on a lovely spring day. 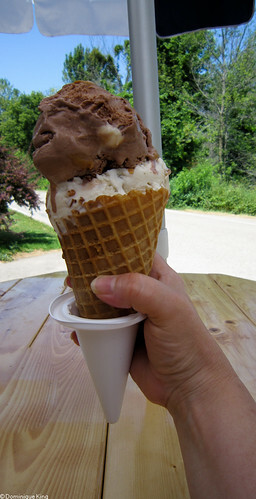 Check it out at the Visit Hamilton County Indiana blog. Borchers Egg Casserole-We stayed at Borchers Bed-and-Breakfast in Grayling, Michigan for a weekend of canoeing and hiking in the area. We had this fabulous Egg Casserole for breakfast one morning. but I didn't get the recipe at that time. Kath took care of my oversight and shares Cheri Hunter's recipe for this hearty breakfast meal at Great Lakes Gazette. We love the village of Chagrin Falls because of the beautiful waterfalls at the center of town and because of its interesting history. We've visited the village in northern Ohio and just east of Cleveland multiple times throughout the years, giving us the opportunity to see and photograph the falls at different times of the years. 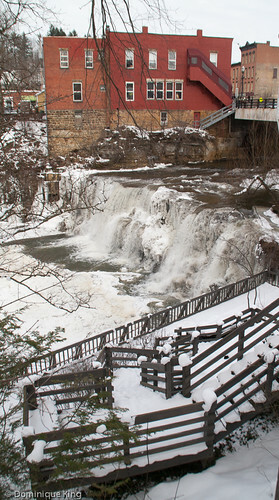 Check out my latest story for the Ohio Tourism Division's Discovering Ohio blog where I share some winter and summer images of the falls along with a bit about Chagrin's history and a short list of some of our favorite places to stop or shop when we visit the village. 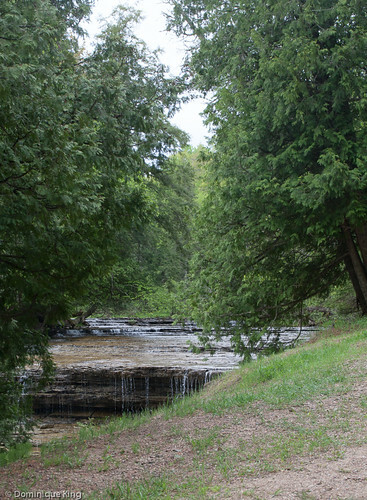 You can easily see the sign for Scott Falls along the M-28 highway, but the falls themselves can be a little more difficult to spot because they are at an angle that can hide them a bit from the road. 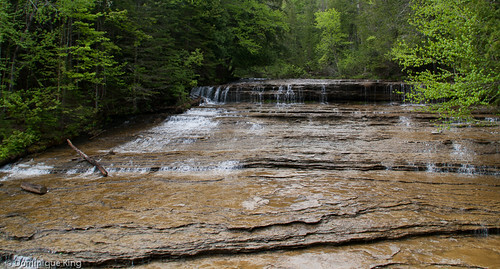 These falls are on the south side of the highway about 7 miles west of Munising near Au Train. They are across the street from H.J. 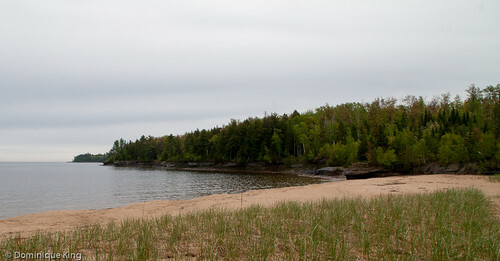 Rathfoot State Roadside Park on Lake Superior's shore. Scott Falls are about 10 feet tall and fall in a straight drop over a sandstone cliff into a small pool. This isn't one of the biggest waterfalls, and the water flow can be fairly thin during the late summer. However, that can make it a really fun waterfall to visit because you can walk back behind the falls and wade in the pool at certain times of the year. I looked at some old images from my trip to the area in July of 1996 and found one that I managed get from behind Scott Falls and looking out over M-28! It was a rainy day and the ground was a bit slick during our most recent visit to this little cascade early this summer, so we couldn't really venture too close to the falls. Rainy as it was, we did manage to hop across the highway to the roadside park to catch this image of the Lake Superior shoreline. 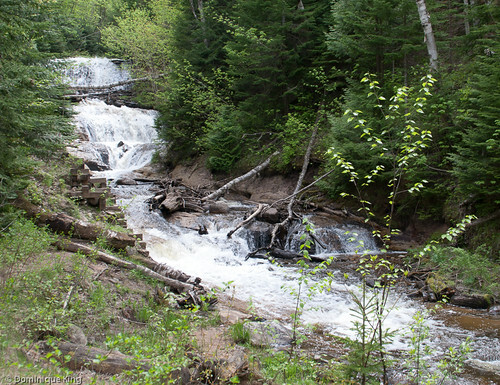 Michigan's Upper Peninsula has nearly 200 waterfalls. Check them out with A Guide to 199 Michigan Waterfalls by Laurie Penrose. 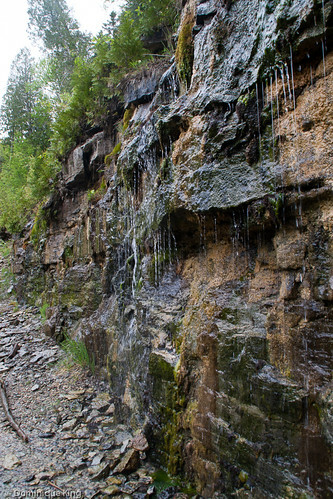 Michigan's Au Train waterfalls can be picturesque, but it can depend on when you visit them or where you are standing when you take pictures of them because of their connection to a power plant that provides electricity for more than 600 homes in the Munising area. Turn off of M-94 about 15 miles south west of Munising and 10 miles south west of Au Train on Power Dam Road to check out both the upper and lower Au Train Falls. The short ride leads to two access points for the falls. 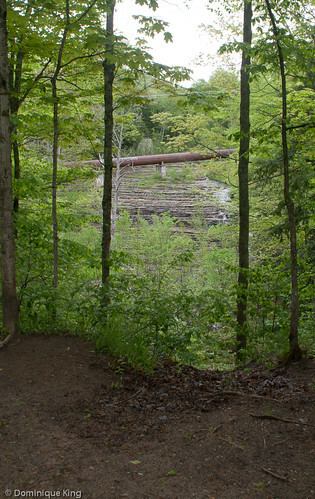 The first small parking area overlooks Upper Au Train Falls, a view complete with a large pipe over the 40-foot-high falls that carries water from a reservoir formed by a small dam and into a hydroelectric generating plant. Taking photos of the upper falls proved difficult because we visited on a rainy and muddy day, which made trying to move in for a closer view pretty much impossible. 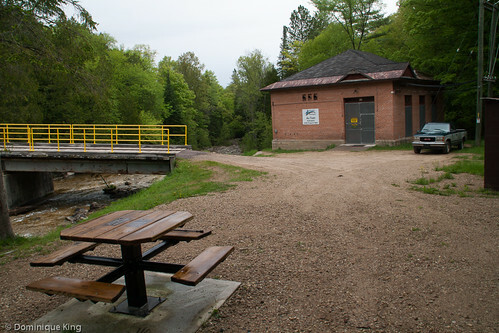 A second parking area near the end of Power Dam Road is the trailhead of a short path that leads to the Lower Au Train Falls. 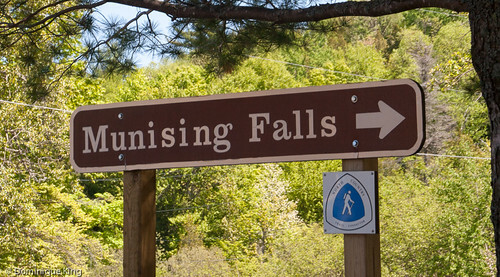 The walk is a slight downhill grade and passes by multiple fresh water springs coming out of the rocky face of the gorge leading to the falls. The lower falls are about a 10-foot drop, but the wide and gradual cascade can make for a pretty image if you choose your vantage point carefully to crop the bright yellow metal bridge and small power plant building out of your images. A sign near the trailhead explains that the Cleveland Cliffs Iron Company constructed a plant here in 1910 to provide power for the Munising Paper factory. The sign also explains how the Au Train Hydroelectric Project differs from many other plants because it has a dam on both ends of the plant. Many other simply rely on a downstream dam to create a reservoir from free-flowing rivers. The Au Train plant creates a basin to collect water from three creeks (Johnson, Slapneck and Joe) and release it through the Au Train Dam. It's best to visit here in spring or early summer because the dams cause the waterfall flow to vary anywhere from maybe just a trickle of water to the heavy torrent of water you may see shortly after the snow melt. There was a decent flow of water at Au Train when we visited in early June, but you could still plainly see the bedrock beneath the falls. I really wonder what these falls would be like if the power plant wasn't there! Alger Falls is one of the more accessible waterfalls in Michigan's Alger County, but it's also among the more difficult to photograph. The waterfall's location near a curve right along the east side of the M-28 highway at the junction of M-94 just outside of Munising means you can catch a quick glimpse of it without leaving your car, but the spot along what can be a busy road during the warmer months makes it more difficult to stop and spend some time taking pictures. Even when you do grab a roadside spot to park and get out of the car, the position of the sun, limited space to position yourself to get the best image and the fact that the water volume of the falls can vary greatly from season to season can make photographing the falls challenging. Still, checking out the multi-level 15-foot-tall cascade is worth the effort. 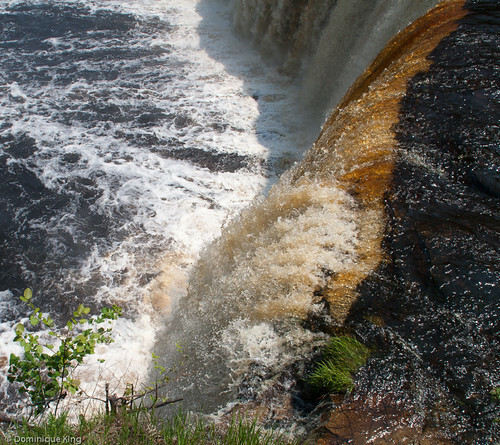 Keep your eyes open as you drive along M-28 as the falls are on an angle to the road that can make them a bit difficult to spot if you're not paying attention. We first spotted them as we entered M-28 at M-94 after dropping by the nearby Wagner Falls. 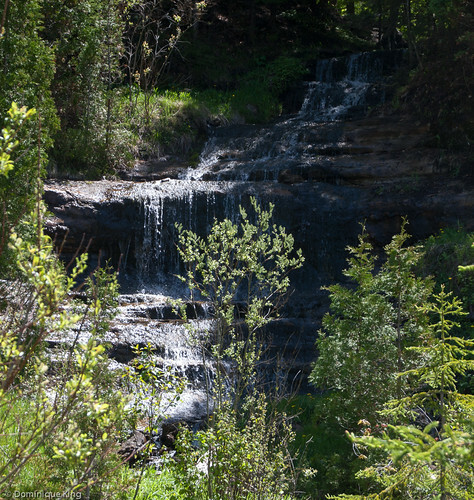 Some folks suggest that late in the afternoon during the summer can be the best time to photograph Alger Falls. A decent volume of water dropping from Alger Creek over the falls during our most recent visit in early June made for some nice enough images, although the soggy and slippery ground alongside of the road and around the falls made it difficult to get very close to the cascade for closer shots. 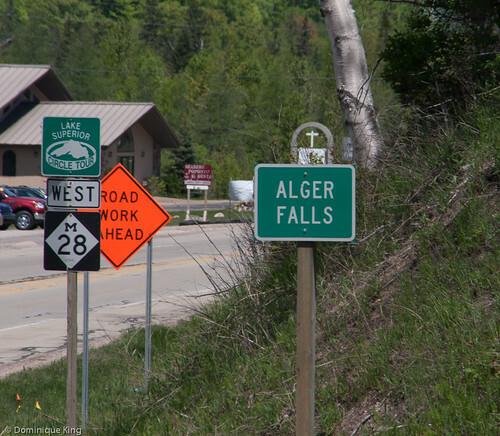 Alger Falls is one of nearly 200 waterfalls in Michigan's Upper Peninsula. 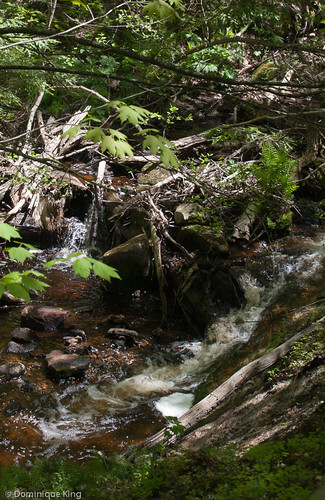 Check the state's waterfalls out with A Guide to 199 Michigan Waterfalls by Laurie Penrose. 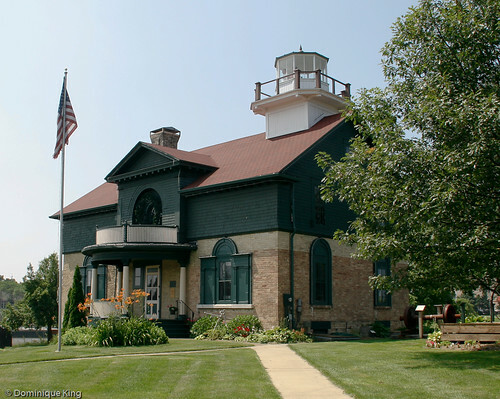 I love my in-dash GPS, but I also find that Delorme's Michigan Atlas & Gazetteer is a great resource to have as you plan your trip and travel through the area. When we first visited Sable Falls at the eastern end of the Pictured Rocks National Lakeshore more than a dozen years ago, the road there was rough and nearly impassable in spots, which may be why far fewer people used to visit this beautiful spot in Michigan's Upper Peninsula. The major access road through the lakeshore, H-58, is far smoother these days, but the falls were still as beautiful as ever during our most recent visit there earlier this summer. 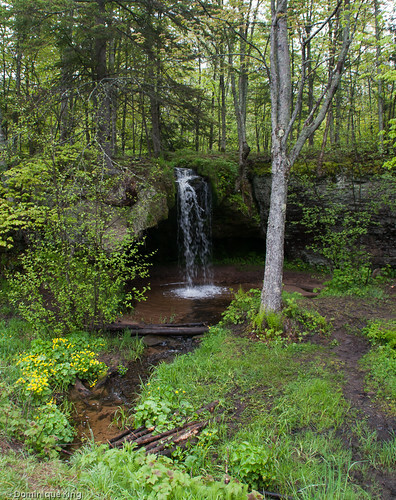 The falls are about a mile out of Grand Marais, and it's an easy and scenic trip to drive on over to Sable Falls after taking in some of the numerous cascades like Miners Falls and Munising Falls about 40 miles away in the western end of the national park. These 75-foot-tall falls drop over a set of multiple shelves or cliffs of sandstone, which are part of the Munising or Jacobsville formation and part of the much longer Northern Michigan escarpment that extends from Tahquamenon Falls 75 miles east of the national lakeshore to the Laughing Whitefish falls about 30 miles west of the Pictured Rocks lakeshore. The falls themselves are just a half-mile walk in from a small parking area, although there are a number of steps leading down a viewing platform near the base of the waterfalls. 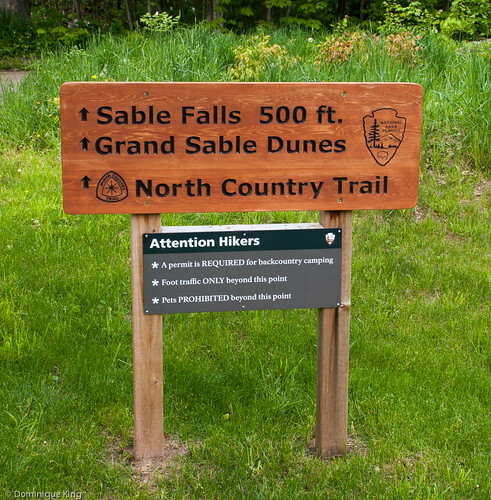 You can also take a trail another half-mile or so past the falls and down the canyon to reach sand dunes and a Lake Superior Beach. 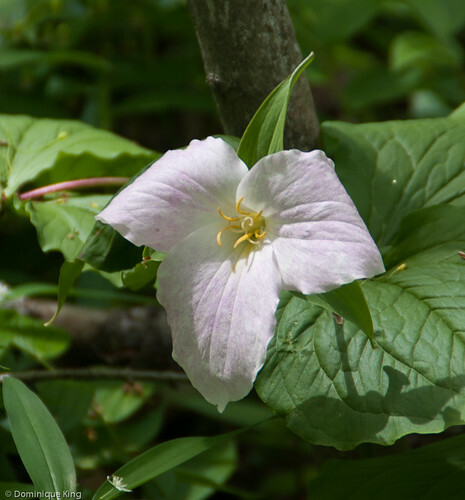 It was still early enough in the year that we were seeing numerous trilliums in the area, so we opted to take our time enjoying the walk through the woods to the falls and spending a little extra time at the viewing platform taking images of Sable Falls. We do remember being able to get a little closer to the waterfalls during our previous visits, but the National Park Service reworked the wooden trails during recent years in the area to help control erosion at the site. Still, it's a pretty spot and, because it is really one of the only major waterfalls at the eastern end of the park near Grand Marais, we had the place to ourselves that afternoon. Sable Falls is one of nearly 200 waterfalls in Michigan's Upper Peninsulas. Check the waterfalls out with A Guide to 199 Michigan Waterfalls by Laurie Penrose. 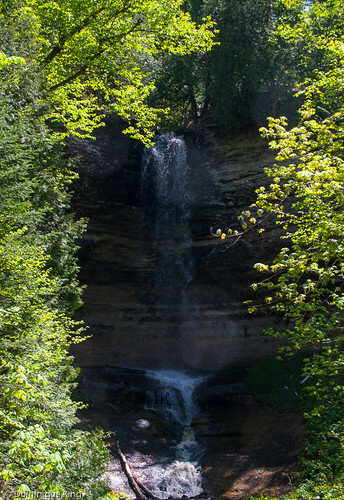 Munising Falls is in the westernmost portion of the Pictured Rocks National Lakeshore and falls mostly within the city limits of Munising, Michigan. It's just a quick trip out of downtown Munising on H-58, and a turn on Washington Street where it becomes Sand Point Road across the street from Munising Memorial Hospital. 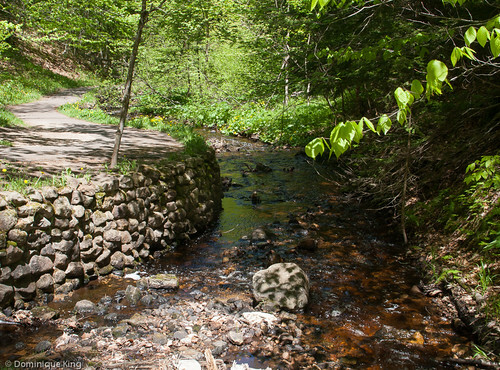 The cascade's convenient location and nicely paved trail make it particularly accessible for those not up to a strenuous hike. There are also a few benches along the way for those who need to rest a bit or just want to linger and listen to the waterfalls. It is also one of the few places in the park where you can take your pet on the trail with you. There is a parking lot at the site and a quarter-mile trail out to the 50-foot-high waterfall. The trail leads past an interpretive center (closed due to budget cuts when we visited in early June, although the restrooms were open at the time) and meanders along the Munising Creek. The walk was particularly pleasant on a hot day as it led through a cool sandstone canyon and through the woods with wildflowers and little mini-waterfalls along the way. The fact that the waterfalls are in a bit of a canyon means their sound echoes nicely along the trail even when you're not close enough to see them. The trail is fully accessible to the main viewing platform, although there are a couple of sets of stairs to platforms on either side of the falls. I found the best view the day we went was at the main platform, although the high noon sun made taking photos a little tough in any case. Munising Falls is one of the few waterfalls in the area more readily accessible in the winter, and the cascade usually freezes to form an ice column (something I'd love to see!). The frozen fall is off limits to ice climbers during the winter, though. Munising Falls is one of nearly 200 waterfalls in Michigan's Upper Peninsulas. Check the waterfalls out with A Guide to 199 Michigan Waterfalls by Laurie Penrose. 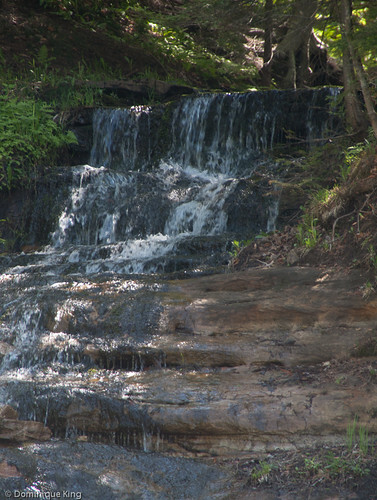 Be sure to check out my stories about other waterfalls near Munising: Revisiting Wagner Falls in Munising, Michigan and Easy Hike to Miner's Falls near Munising, Michigan.